Choosing the best handheld vacuum for pet hair can be quite confusing, since there are so many different vacuum models that either specialize or are suitable for cleaning pet hair. They all claim to be more effective than the rest of their competition, but the only way to find out is by putting it to the test. Below we explain what you need to consider when choosing a handheld vacuum for pet hair cleaning, and have a few recommendations that have been tested by real customers and given high ratings. If you want just want to get straight to it, then check out our Best Handheld Vacuums For Pet Hair Comparison Chart or read our Top 5 Best Handheld Vacuums For Pet Hair summary. Before you make your purchase of a handheld vacuum for pet hair, you need to take the following things into consideration, which will ultimately affect not what you want, but what you need. We will count only cats and dogs, as both these pets are usually the primary suspects in leaving behind masses amount of hair in homes. If you have only one, then you likely won’t need the most powerful handheld vacuum and an inexpensive cordless one should do the job. However, if you have two or more pets, then it’s a good idea to get either a corded model or a cordless one that has an exceptional battery. Chances are, you’ll be cleaning for a long time and will need a handheld vacuum that has a good running time as well as one that has good consistent suction power. Aside from the suction power of the vacuum, another thing that adds to the effectiveness of cleaning pet hair is its attachment head. Based on our research and user experiences, attachments that use rubber material are the most effective in picking up hair. Another effective attachment comes in the form of a motorized brush, which can be used to removed pet hair as well as ground-in dirt. 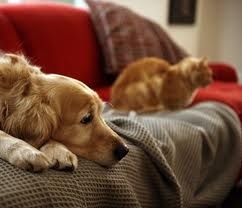 Some handheld vacuums for pet hair have either one or the other, or even both. What Is The Best Type Of Filter To Use? When cleaning pet hair and other dirt, a filter can be clogged up quickly, so it’s advisable to get one that can be removed and washed easily. Many handheld vacuums for pet hair use standard filters, but some adopt the use of HEPA filters, which gives users a health advantage. HEPA (high-efficiency particulate absorption) filters are designed to target and trap much smaller particles and pollutants, such as tobacco smoke, dust mite feces and pollen. These can cause allergic reactions and those who suffer from asthma will also be affected. There are several handheld vacuum cleaners for pet hair that have risen above their competition, based on usability and effectiveness. We’ve chosen three, two corded and one cordless model of varying prices that we and many other users, believe to provide the best value to pet owners. The best alternative to Dyson’s Animal range of vacuums is the Sharkk Rocket HV302 (read full review) which offers unbelievable value at such a great price. 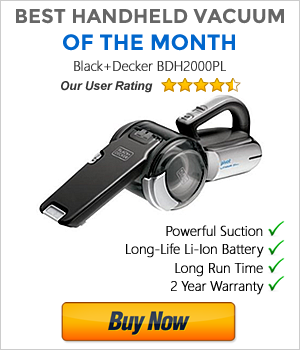 It’s essentially a handheld vacuum with upright capabilities because of its long wand and powerful motorized brushroll that can deep clean carpets and bare floors. It also comes with multiple attachments that helps you to clean various areas inside your home whether it’s tight spaces or far reaching areas. Since its release in late 2013, it’s garnered overwhelmingly favorable reviews and has become a best seller. It’s no surprise why many consumers have chosen this over the much more expensive Dyson Animal. 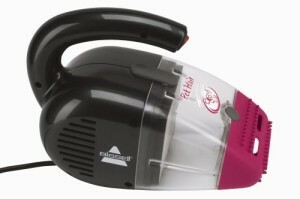 The BISSELL Pet Hair Eraser 33A1 features a compact design that has an interchangeable hard nozzle and flexible rubber contour nozzle, its primary weapon for cleaning pet hair. It has a 16 foot long cord with a cord wrap system, and it uses a HEPA Media filter. Users have found it to be a simple yet effective device. Approximately 85% of user reviews on Amazon have voted it to be between 4 and 5 out of 5 stars. 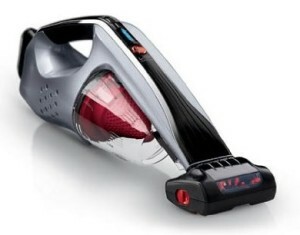 Perhaps the most impressive thing about the BISSELL Pet Hair Eraser 33A1 is of its low price point, making it one of the best value handheld vacuums for pet hair. The Hoover Platinum LINX Pet BH50030 (read full review here) is one of the most powerful cordless handheld vacuums designed for cleaning pet hair as well as general home cleaning tasks. It sports an interchangeable Lithium Ion battery that has a long run time and its power doesn’t fade, resulting in consistent suction power. It includes a Power Head Brushroll that can pivot at a 25 degree angle, a Deluxe Dusting Brush for cleaning delicate surfaces and a Pet Upholstery tool which features three rubber blades specifically for grabbing pet hairs effectively. 84% of Amazon user reviews are 4 stars or above out of 5, making it one of the highest rated cordless handheld vacuums.